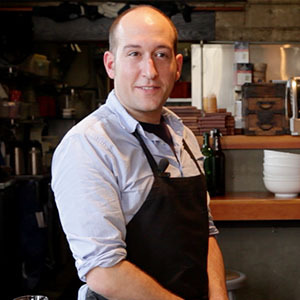 Raised in Des Moines, Iowa, Chef Gabriel Rosen owns and operates popular izakaya, Biwa and sister ramen and juice restaurant, Noraneko in Portland, Oregon. Chef Gabriel opened Biwa with business partner and wife, Kina Voelz in 2007, hoping to fill a void with the restaurant’s simple but delicious Japanese fare. Biwa’s great success inspired an influx of Japanese ramen shops in Portland. In 2015, Chef Gabriel opened his own ramen restaurant, Noraneko where he serves infinitely customizable ramen and house made kombucha and juices. Chef Gabriel began working in the restaurant business in 1995 while studying at University of Iowa. Chef Gabriel graduated from the Western Culinary Institute in Portland in 1998. He then rotated through several well known Portland kitchens including stints at L’Auberge, Saucebox, Fratelli Ristorante & Bar. He also worked as a butcher at craft butcher shop, Viande Meats. This versatile root, commonly found in Asian cuisine, has a clean apple-like texture with a smooth radish flavor. This simple dish is perfect as a fast, casual meal or as a snack served with a drink. Watch Preview Upgrade to view the full tutorial. Learn how to make these traditional, pan fried and steamed Japanese dumplings. This salad is a light, sweet, and tangy side dish, perfect for a Japanese style meal. This traditional Japanese food proves "fast food" can be flavorful, healthy, and delicious. Learning how to trim unwanted parts off a hanger steak will allow you to fully utilize this flavorful and versatile cut of beef. © Copyright 2014 Salted. All Rights Reserved.